Want a little edward & lilly magic on your Christmas tree this year? All you need to do to be in the running to win one of my red Christmas birds is to leave a comment on this post. For two entries facebook or tweet about the giveaway and leave another comment to let me know. Don't forget I can't contact the winner unless you leave your blog link or email in the comment. Open to anyone in the world. Giveaway closes on Sunday night (19 Dec) and a little red bird will be express posted on Monday to reach you (hopefully) by Christmas. And if you're in Brisbane don't forget to check out the BrisStyle Indie Twilight Market on Friday night at King George Square in the City. Details here. Love your birds, and this one would fit in perfectly on my tree!! I would like one too :) Just have to say that those tissue cases are one of the most beautiful that I have ever seen. Love that you use so much natural linen. Oh little red robins why don't you wing your way to my nest? The birds are so lovely! Pick me!!! Oh how sweet, Hope I win. I adore all of your pretty items and would love to win these little birds. p.s. I'm having a little giveaway over at mine if you would like to enter. These are beautiful! Would love one on my tree! Good luck at the Brisstyle market tomorrow night toooo! Lovely birds! Thanks for yet another giveaway! Holiday Greetings from Toronto, Canada! I just tweeted about your fantastic giveaway. Happy Holidays! So sweet! I can hear their sweet songs now! What gorgeous ornaments, I'ld love to win one of these!! Oh my goodness, I've been eyeing these lovelies since *last* Christmas! I'd love to win one! Lovely birdies! How nice of you to do a giveaway, some lucky person will get a Christmassy treat. They are beautiful and would look lovely on our tree - thank you for the chance! Love these! Thanks for the chance to win them. I have always admired your little birdies on Etsy and Made it and other blog posts, they are just so darn cute! These are so sweet. I'd love to win. Thanks for the chance. What a sweet little tweet... thanks so much - I am new to your blog! very nice! These are adorable! Thanks for the chance to win one! I also posted about the birds on Facebook. Your tiny birds are gorgous! I'd love to be enered in your give away! I'd love the chance to win one. So pretty! Would look wonderful on my tree!! Happy Holidays!!!! Please enter me in your drawing for a bird. I can smell them now. Thanks. Adorable little redbird you have made. I would love to win one of them. These little red birds are adorable and I love the embroidery - very special! Thanks for the chance, I would love to win one! So adorable! Thanks for your generosity. I would love one of those little birds. They are sooo cute! I also love your embroidered brooches. Thanks for the chance to win! What lovely birds! I would adore one for our family tree! Lavander....ohhhh, my favorite scent ever! I would love to have one of these little beauties for my tree! Or just in my house! I would love one of your beautiful ornaments to decorate my home for the holidays! I adore bird ornaments, and yours are simply lovely. 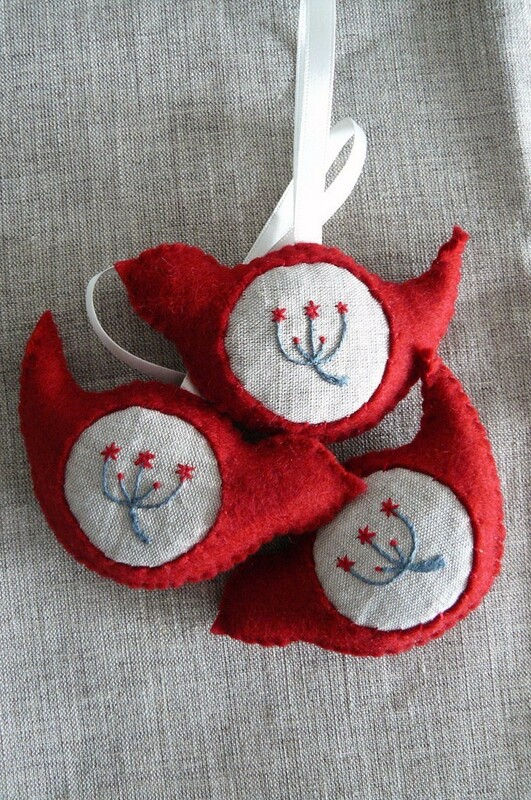 Oooh, I brought one of these little red birds at the Twilight market tonight, but as a gift. I would love to win one for myself! Such dear little birds! What a neat giveaway. Thanks! Those little birds are absolutely adorable!!! Thank you so much for the lovely gioveaway!!!! I visited Brisbane in 2005 and had a wonderful time shopping for craft supplies and handmade items. Got a few of my favorite Christmas ornaments there. Love this little bird! such lovely handwork! thanks for the chance and happy holidays! Just ADORABLE! Thank you for the giveaway! I like all the above they are very nice thanks for sharing them here..